ID USB Lock Key is a security program meant to protect your computer from unauthorized users. It denies access, by providing a security block-screen which can be unblocked with the USB stick where you have the key generated by the program. You can download a 14 days trial version or you can get your hands on license on the safe order page. 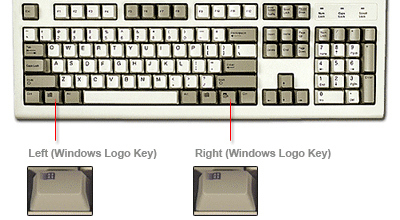 The easiest way to lock Windows XP is by simply pressing the Windows logo key and the letter L (for Lock) on a Microsoft Natural Keyboard or any other compatible keyboard that includes the Window key. Doing so will pop-up the Unlock Computer Password box. Look on the bottom row and to the left of the spacebar on your keyboard. Do you see a key with the flying Windows logo? Depending on your keyboard you might also have one to the right of the spacebar. Users running Windows 2000, Windows XP or Windows Vista can lock their computer using the Task Manager. Step 1 – On your computer keyboard, press the <Ctrl+Alt+Delete> keys at the same time. Step 2 – The Windows Security window should appear. Step 3 – Click the Lock Computer option or button to LOCK your computer. Step 4 – You will see a pop-up window displaying the Unlock Computer Password Box. You can also use the following keyboard shortcuts with a Microsoft Natural Keyboard or any other compatible keyboard that includes the Windows logo key and the Application key. Published: 07 Aug 2008 by Cristina Mailat, in: Protection, Tutorials Tags: how to, lock computer, lock keyboard RSS feed for comments on this post. My laptop was on standby to long an it locked up the computer how do I unlock it now. Very Good. The Above Information is very Helpfull.